Fiat Panda 1.3 Multijet review | What Car? 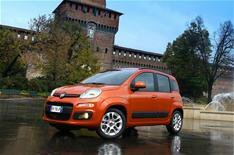 This diesel version of the new Fiat Panda uses the 1.3-litre Multijet engine found in a host of Fiat models. The new Panda is based on the previous car, but has been substantially updated to take on all-new rivals such as the VW Up. An increase in length improves boot space, and in models with the optional sliding rear bench, rear legroom, too. There's also a redesigned interior with 14 stowage spaces and a new dashboard. What's more, the suspension has been upgraded to improve ride comfort and sharpen steering feel. For the first time on a Panda, a system that automatically brakes the car at town speeds if a collision looks unavoidable is available, but it's a surprise that stability control is still only an option. What's it like to drive? The diesel engine in the new Panda is noticeably stronger than the original Multijet diesel that was used in the previous-generation Panda. Power is up from 69bhp to 74bhp, but more significantly, there's a broader spread of torque; the Panda pulls strongly from just under 1500rpm through to around 4000rpm. As a result, it's much easier to get up a decent head of speed now. This, and the fact that the new engine is much quieter, makes the latest Panda an entirely viable car in which to tackle long distances, especially because there's little wind- or road noise. True, there's some body roll in bends, but it isn't bad enough to be off-putting. Fiat says that the revised front suspension has improved steering feel, but while its movements feel less electronic than before, there's still little feedback. This diesel model's heavier engine makes it feel less agile than the petrol's in corners, too, and at middling speeds, the diesel has a slightly choppier ride. What's it like inside? This is a budget car, which is why you won't find many soft-touch plastics in the cabin. The interior is still attractively styled, though, and the dashboard is available in a number of interesting colours, including red, tan and metallic blue. These, in combination with attractive and fashionably patterned upholstery, make for a cabin that's decisively more inviting than before. The square instruments, which feature rounded corners, are stylish if slightly reflection-prone, and the piano black-finish to the stereo and air-conditioning controls of higher-end models adds a touch of class. More practically, the controls are easy to use, including the high-mounted gearlever, and the seats are comfortable. That includes the rear bench, as long as it's occupied by no more than two people. It's just a pity that you have to pay extra for the sliding rear seat and versatility packages that enable you to order the rear bench with either a 50:50 or 60:40 split. Should I buy one? The new Panda should be on the shortlist of anyone in search of a budget commuter car, especially if they need something practical (there's always Fiat's chic 500 if load-carrying ability isn't a priority). This diesel version needs careful weighing up, however, because it costs thousands more than the 1.2-litre petrol Panda that's likely to be the big seller in the UK. True, the diesel is more economical, averaging 72.4mpg compared with the 1.2 petrol's 51.4mpg, but you'll need to drive a lot of miles to pull the difference back. If it were our money, we'd stick with the 1.2 petrol.